Resume clears the Runtime Flow and Runtime Summary windows and resumes normal monitoring events processing. 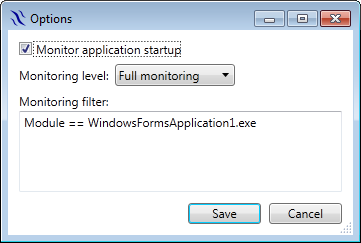 With Monitor application startup unchecked, no flow data is collected until you click the Resume button. This is useful when monitoring complex apps with very big initialization routines that you are not interested in. Download links for Runtime Flow v1.3.0: Visual Studio edition, Portable edition.